Hollybeary Creations : NND Release Day 3! Hello everyone.. I hope you are having a great week so far. 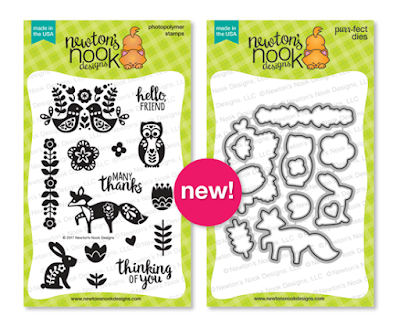 It's Day 3 of the Newton's Nook Designs Release peeks and today we are showcasing Cottage Garden. I started out by die cutting a panel of White cardstock and then I stamped one of the images in the set onto the center using the Fall Ombre Ink pad from Hero Arts. I used my Misti tool and stamped the image twice. Then I stamped the sentiment just on the lower edge of the image in some VersaFine Black in for a crisp image. I created a Top Folding Black card base and adhered the panel to it. For some added sparkle I added some Mixed Gold sequins. I love the look of the Gold with the ink colors. There are a ton of fun images in this set and they work really great with the Ombre inks or you could use these images with the Rock n' Roll techniques for some stunning cards. I love the clean look of your card. It looks really elegant. I love this set! And I love the ombre look, too. Beautiful card! gorgeous ombre effect with the stamping! This looks like a must have set! Lovely card, looks perfect for a house warming or welcome to the neighborhood! Very sweet. I like the ombre ink pad you used. This stamp set is also so cute! Little animals and flowers, lovely! Your card is lovely, the birds are beautiful! Very sweet and lovely design! Love the beautiful colors on this pretty card! The Cottage Garden set is a delight! Beautiful card, so pretty with the ombré ink. Love your card designs - this is just beautiful! Love the ombre look with the good sequins. Nice clean simple card that is gorgeous. Love this card. The ombré ink is such fun! Very pretty ink spectrum on this inage. This is so gorgeous! I love the ombré colored ink on this image! What a beautiful and simple card! Beautiful CAS card! Love how versatile this set is! Your card is so elegant. Just beautiful.